Geez. These days are scraping by faster than I like. It’s already Wednesday. No matter though. I’m back once again with a costing edition of the Nunavut updates. We headed to the GTA this past Monday to start our hunt for our outdoor gear. We had priced out some of the apparel a couple weeks ago at a store called Adventure Guide, but Suzanne ended up finding better deals at a wickedly cool outfitter called LeBaron. They have store locations in the GTA so we figured we’d hit the closer of the two and headed to Mississauga first. Beware. Here comes the shameless plugging. Their store is insane. If you’re an outdoorsy kinda person this is the place for you. They cover the full gamut from hunting weapons and equipment to outdoor apparel and supplies. They also ship anywhere in the world, except locally (meaning that if you live in an area where they have a store you have to go to the store). 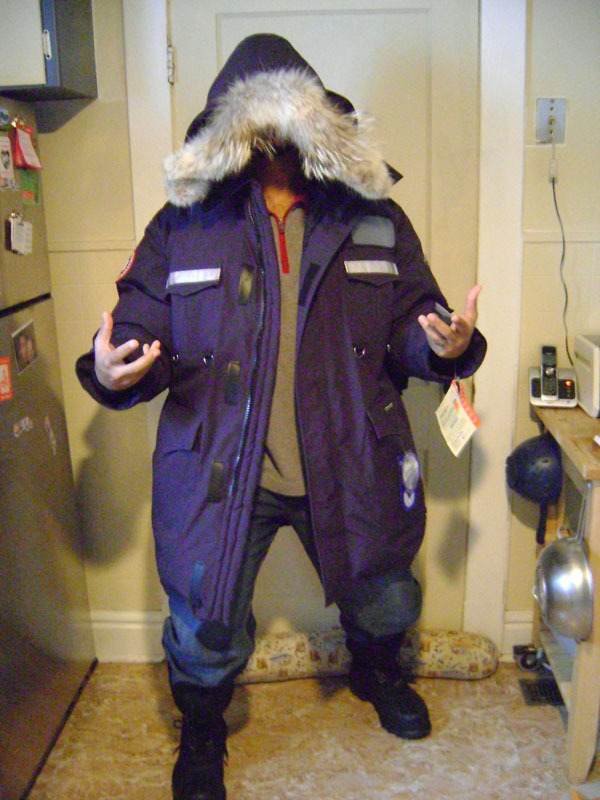 We went in with the intention of getting some Expedition style Canada Goose parkas. They came highly recommended by folks who actually live up there and we had tried them on at Adventure Guide so we were pretty much set on what we wanted. Unfortunately available sizes in the Expedition style were lacking so we ended up taking a look at another recommended style called the Resolute. Personally I liked the fit, feel and look of the Resolute more then the Expedition. It’s lighter than the encumbering Snow Mantra style but offers more features then the Expedition (inner & outer pockets, waist tapers, etc). The XXL was far too large for me so I went with an XL. Unfortunately it was the last one left of that size left in black or navy and that size just so happens to be what she wanted as well. Neither of us were too partial to the attention grabbing red ones available so we were forced to face one another Gladiator style for possession of the last XL. Suzanne was actually looking forward to a brown or green parka so she called their other local store to ask if they had any of that style in stock. Thankfully they had quite a variety of colors and sizes at the other store so she asked that they set the brown one aside and we would head to Markham next to pick it up. We signed up with their membership program which gives a 20% discount on everything except the coats (which receive a 10% final sale discount). Either way it’s an awesome deal considering how much all this gear costs so we decided to take advantage of it and purchase some other necessities while we were there. Suzanne and I tried on some Baffin Impact -100c boots. They’re just about the most moon booty boots I’ve ever seen. You clunk around like Robocop and they add at least another couple inches onto your height. It’s almost like walking in platform shoes. Remarkably though they’re not too heavy so I can’t see getting too worn out having to tromp around in them for extended periods of time. She ended up going for it and snagging a pair up. I on the other hand had fell in love with a pair of -60c Sorel Alpha Pac boots that I scouted at Mark’s Work Wearhouse last week. We were advised to get at least -40c rated boots so these fell well into the target range. Having 100’s would be cool but I think I’ll do just fine with the 60’s. Besides with the 60’s I can make use of my rockin’ wool socks that Nana gave me for Christmas oh so many years ago. It’s as though she knew I’d be needing them. We went with Baffin Polar Mitts for the both of us. Mitts are recommended over fingered gloves primarily because you’re trying to keep your digits as warm as possible and the best way to do that is keeping them close together. She ended up getting plain AuClair glove liners while I went with their HotTips style. We also tacked on Polartec Windstopper Balaclavas (aka face warmers) as well. They rock. Makes you sorta look like an arctic ninja. After a 20 -25 minute cross town drive to Markham we picked up Suzanne’s jacket and were set to come back home with plenty of time to spare. Unfortunately we caught sight of the notorious Ikea sign on the way back and somehow ended up there. An hour later we found ourselves stuck in in Toronto rush hour traffic. Damn you Ikea! For those of you who know about Toronto rush hour traffic, I needn’t say more. 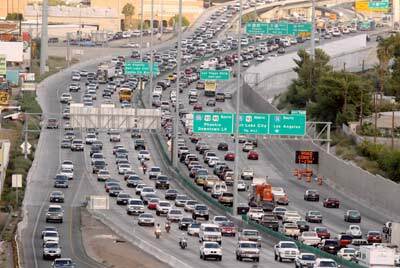 However if you don’t know what that means, try to imagine then worst traffic you’ve ever been in… then magnify that by like 100. I swear… that region is like the most congested, convoluted, confusing and frustrating stretch of roads I’ve ever seen. I have no idea how people navigate that zoo on a daily basis. Anyway, rant over. Once the sun was long gone and we were back in the Kitchener region I snagged up my boots. I was lucky enough to have caught them while they were on sale (20% off). Matched with a discount we received from having purchased some thermals the previous week it ended up being a cosmic alignment deal. While it would have been nice to get some pants and goggles as well, finances dictated that we can hold off on that for a bit. Besides the weather isn’t that awful up there just yet according to our inside sources so we can manage without them for the time being. Once the weather takes a turn for the worse then we can get that gear while we’re up there. The word around town is that if you can get your jacket and boots in the South, do it. It’s not so much that it’s super expensive to get them up there (something like maybe $100 more) but the fact that there’s not much of a selection. So if you’re coming up for long term do yourself a favor and get those two key pieces of apparel locally and get the rest (if need be) when you come up. Let me tell you something, this stuff adds up after a while. Unlike Southern Ontario where you can get away with wearing Gortex jackets and toques, up there it’s a different story. There’s really no option to skimp or go budget on anything so it’s up to you to find the best deals possible. Don’t think in any way, shape or form that we’re trying to flaunt what we got by listing these labels and prices. Truth be told if it wasn’t for the generosity of some family members we wouldn’t have been able to purchase half of this. Our intention is to help others out who have little or no information about the equipment needed for the up there. We were lucky enough to have people who live in the territory (thanks Mark, Andrew & Milissa) who give us first hand information regarding what to and what not to get. We’re simply paying it forward to whoever else may be doing research like we were and looking to make such a trek. 4 more days before the insanity gets cranked up a notch. Can’t wait! We were visited by a rep from the moving company on Monday. We gave her a walk-through of the house and let her know what we were taking with us (on the plane) and what we wanted shipped up. In the end she was surprised at how little we had to actually bring (despite the mountains of clutter she bore witness to). We’re allotted something like 6000 lbs (that includes packing materials) but we fell way under that at barely a guesstimated 1400lbs. We were also astonished at how much they’d actually pack themselves. She suggested that we let them do it because then our stuff will be covered under their insurance as opposed to if we packed it up ourselves. We’d only be covered if there was visible damage to the boxes themselves (and even then it would be a minimum) so that was kind of a no-brainer. With the load of having to do heavy duty packing off our shoulders we were forced to deal with an old but persistent problem – the crap we’re supposed to get rid of. I spent the past couple of weeks boxing, bagging and tagging a good portion of the stuff we’ll be putting into storage. That was the easy part. Seven bags of garbage and four mega loads of recycling later we still have tons of crap to get rid of. Our ultimate plan was to either pitch a good portion of it or bring it down to the local goodwill & second hand stores. Why give things away or dump them when you can make a buck off them? It’s the North American way. Sure charity and goodwill are good for the soul but it won’t pay the bills or keep us warm up there. 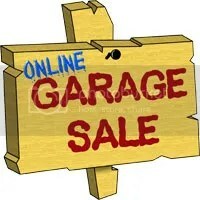 There is an online classifieds site I use often to get rid of things locally. It’s called Kijiji. It’s similar to Craigslist in a lot of ways. Since we have so many things to offload and I didn’t feel like making individual ads for each thing I decided to employ my web design know-how to make a bare bones web page with all the for sale items on and and use Kijiji as our starting referral point. There was a small fee involved with posting a link from there to our site but it was a worthwhile investment. Hopefully we’ll get some bites and get some of this stuff offloaded during Hell Week.